Every business is different. When procuring your stamped laminations with Laser Technologies, you will never feel like you are simply a number on a balance sheet. Our approach to solving your company's lamination stamping requirements is much different than the conventional "off the shelf" catalogue stamping houses. 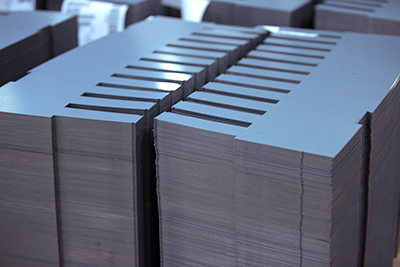 Our stamping business model offers a truly unique and fresh approach to the way your company is used to buying stamped laminations. We have a flexible approach when providing lamination stamping services. Our solutions-focused philosophy stems from the same principles that have enabled us to become the largest Just-In-Time laser manufacturer in North America. Flexibility, customization, quality, quick turnaround times, and personalized service are foundation on which we have successfully built our business over the past 30 Years. Hybrid Stamping is a proprietary process we developed to provide the benefits of both progressive and compound lamination stamping, offering you lower tooling costs and quicker turnaround times. Designed for laminations up to 8 " in diameter, Hybrid Stamping can be a cost-effective solution for low-to-medium volume production runs. Low Tooling Cost - our hybrid tooling averages around 1/3 the cost of standard progressive tooling. Superior Accuracy - our hybrid process is designed for stringent tolerances often required in the motor lamination industry. We deliver precision when it comes to concentricity, flatness and hole locations. Quick Turn-Around - our tooling is designed to be manufactured in weeks, not months. Progressive Stamping produces a complete part with no secondary operations. Used in conjunction with an automatic feed, the progressive stamping process produces high quantities of parts in a short amount of time. Though dies typically take longer to build and often incur higher manufacturing costs, Progressive stamping is ideal for complex parts requiring precision tolerances. 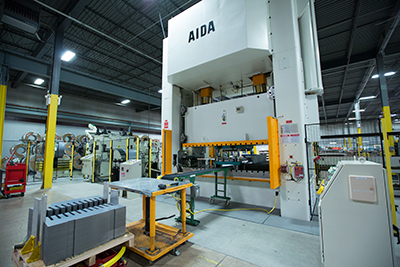 Press Bed Sizes up to 60" x 120"
Compound Stamping produces a complete part in one station. While production rates of compound stamping are usually slower, the cost of tooling is less expensive and the lead times to build the tooling is quicker. 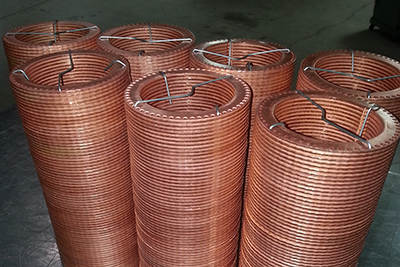 Compound Stamping is a good solution when production quantities are low and you require components manufactured with superior concentricity, flatness and location. Rotary Notching is an economical solution for large laminations that eliminates the high tooling cost and long lead time of stamping. Parts can be produced in weeks, not months with rotary notching. Our CNC Rotary Notching press utilizes a Servo Driven Indexer which is capable of running speeds up to 1,200 strokes per minute and produces highly accurate parts with precise position indexing tolerance. Designed for low-to-medium volume production, Rotary Notching is an alternative approach to producing rotor and stator laminations at a fraction of the price of conventional hard tooling.